A group of concerned citizens met Wednesday at the Sandpoint Community Hall to discuss North Idaho Crisis, the new 24 hour crisis hotline that will offer supportive listening to those in need of mental health crisis assistance. From left to right: Amber Snoddy (NAMI Board President), Catherine Perusse (NAMI Board, Crisis Line Project Manager), Brenda Hammond (BCHRTF Secretary and Past President). Photo by Donna Brundage. North Idaho Crisis, which is slated to become operational in January, is a 12-month pilot program consisting of an after-hours crisis hotline answered by a local, masters level mental health clinician. The clinician then has the option to forward the caller onto 911 if the situation warrants. According to Perusse, it’s a positive step for this community to address the prevalent issue of mental illness in North Idaho. According to National Alliance on Mental Illness (NAMI)Far North President Amber Snoddy, having the ability to educate families dealing with mental illness is a priority in Bonner and Boundary Counties. While people might be willing to call a free hotline, Perusse said sometimes they are more reticent to contact a governmental agency such as the Department of Health and Welfare when they need assistance. 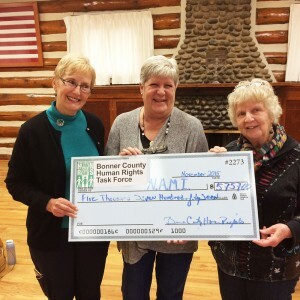 Along with NAMI Far North and Bonners Partners in Care Clinic, the Bonner County Human Rights Task Force (BCHRTF) has been instrumental in getting North Idaho Crisis off the ground. At Wednesday’s meeting, BCHRTF presented NAMI Far North with a check for $5,757 to cover the first month of operational expenses, including the cost of phones and the staff to operate them. Perusse also added that NAMI Far North is actively seeking more donations to get the pilot program off the ground. If interested in donating, see the end of the article for contact information. Mental illness is no stranger to Idaho. For decades, Idaho has ranked in the top 10 in the nation for the number of suicides per capita. In the last 10 months, there have been four suicides in Sandpoint, a number far above the norm. Also, suicide is the second leading cause of death for Idahoans age 15-34 and males age 10-14. The leading cause of death is accidents. Between the efforts of the Bonner County Human Rights Task Force, Bonners Partners in Care Clinic and NAMI Far North, the hope is to provide help when it is needed and reduce these numbers in the near future. “Recovery isn’t a destination, it’s a process,” said Snoddy.